This week has been designated history week at St Caimins Secondary School in Shannon and one of the history teachers there asked me if I would come in and speak with some of the students about a research history project that I had previously completed on the Industrial School Child in Ennis. I was happy to oblige – I completed this project as past of my Masters in Local History a couple of years ago and I am happy to share the information with people so that it can see the light of day. 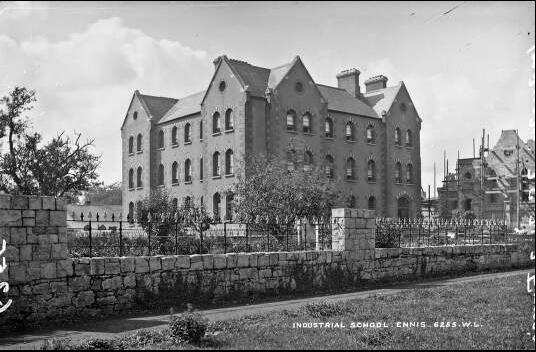 Many people don’t realise that there even was an industrial school in Ennis at one time. The building was knocked in 1982 (it had been located towards the back of the now Temple Gate Hotel near where the Credit Union stands today). It operated as an industrial school up until 1963 by which time over 1,000 girls had passed through the institution. It was first certified as an Industrial School in 1880 and for most of its time in existence it accommodated approx. 100 girls and, as the only industrial school ever in Co Clare, it was once one of the county’s primary centres for the care of orphaned and destitute children. Children would normally enter the school from age 6 upwards and, in what was really a type of social experiment of the time, they would often remain there until they had reached sixteen years of age. Incorrectly referred to as an orphanage in the past, in fact only one in five of the girls in the school were actual orphans – most did have a surviving parent – but they were often too poor to keep their children. I investigated the school from its certification (in 1880) up until 1911 (being restricted from accessing later archived information because of data protection rules). In Ennis, as in other industrial schools in Ireland at that time, it was poverty that had children in the school. But despite being reared in an institution, family ties often remained strong and there are many stories and insights to be gleaned from the convent archives of family involvement in the schools and the role that family and society played in the operation of the schools. This has inspired me to study this area further on a national scale. One of my stops on the walking tour explores the history of the school and the stories of the girls and their families – it gives us an insight into the circumstances of the lives of the poor as well as a glimpse into the often invisible history of poor women and girls.